True Sriracha lovers will gladly dump the coveted Asian hot sauce on anything. Thanks to a new Sriracha-storing keychain, in a pinch, addicts can always have 1.25 ounces of the good stuff on hand. Sriracha2Go is a tiny tube that could theoretically carry anything, but is clearly prepared to handle the Internet’s favorite spicy red sauce. It sports Huy Fong Foods signature green top and white lettering – though these little bottles replace that brand’s rooster with their own dragon because the two companies are not affiliated. 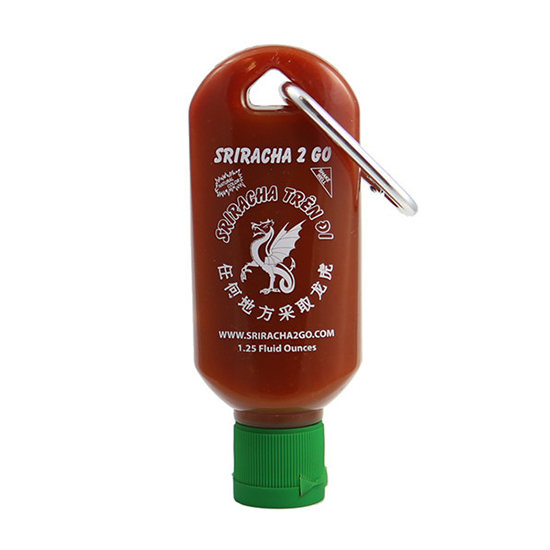 Once filled, you’ll be all set with a traveling 1.25 ounce Sriracha stash that measures just 4.5 inches by 1.6 inches. Though it might be a bit much to constantly carry around in your pocket (it’s about an inch longer than an iPod Nano), Sriracha2Go is perfect for purses – so Sriracha-loving single guys, time to get a girlfriend. Sriracha2Go sells for just $7 – shipping included. It’s a small price to pay until restaurants wake up and realize, to hell with salt and pepper, we need Sriracha on every table.